The yellow shows old reconstruction, the black shows new reconstruction and the grey shaded shows observations. Credit: GEOMAR. 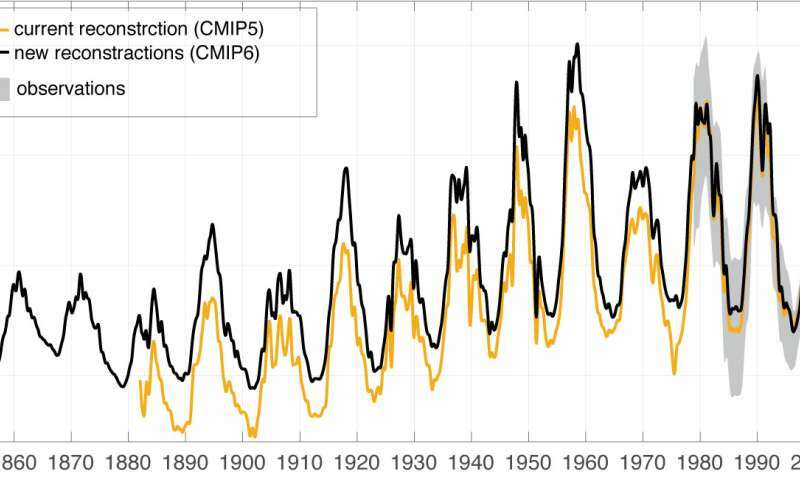 How much do solar cycle variations influence our climate system? Could rising Earth temperatures due to anthropogenic effects partly be compensated by a reduction of solar forcing in the future? These questions have been the subject of climate research for a long time. Researchers need to know the fluctuations of solar forcing on the timescale of the 11-year sunspot cycle as precisely as possible in order to use these as input parameters for climate model simulations. An international research team led by the GEOMAR Helmholtz Centre for Ocean Research Kiel and the Instituto de Astrofísica de Andalucía (CSIC) in Granada (Spain) have now published a new dataset, which will be used as a basis for all upcoming model intercomparison studies, and in particular, the next climate assessment report of the Intergovernmental Panel on Climate Change (IPCC). "For solar irradiance, we have essentially combined two data sets, one from our American colleagues and one from the Max Planck Institute for Solar System Research in Göttingen," explains the first author Prof. Dr. Katja Matthes from GEOMAR. "In this new data set, the variability in the UV range is stronger than before. This leads to a warming of the stratosphere and increased ozone production at the maximum of the sun's activity." The scientists expect that this new solar forcing will lead to more pronounced signals in the stratosphere at heights between 15 and 50 kilometres, which might influence surface climate through complicated interaction mechanisms. Further innovations of the data set are a new reference value for the so-called "solar constant," the total solar irradiance, i.e. the irradiance averaged over all wavelengths. The new estimate is with 1,361 watts per square meter lower than before. In addition, the effects of energetic particles are considered. The new data set will be used in coming years as a reference for the sixth cycle of an internationally coordinated intercomparison project of coupled ocean-atmosphere models. The so-called CMIP (Coupled Model Intercomparison Project) experiments are an important quality check for climate models and are the basis for IPCC's climate assessment reports. What do scientists expect from the new data set? "In our future scenario for CMIP6, we provide a more sophisticated estimate of the future development of solar activity after 2015," explains Dr. Bernd Funke, co-author of the study. "By 2070, a decrease of the sun's mean activity to a smaller solar minimum is expected. This counteracts the anthropogenic global warming signal, but will not have a significant influence on the development of global average surface temperatures," Dr. Funke continues. However, regional effects should not be negligible. In addition, for the first time, a quantification of solar irradiance and particle effects will be possible. The new data set is the outcome of a large, interdisciplinary team effort, from solar physicists and energetic particle experts to climate modelers. This work has been carried out as part of an international project of the World Climate Research Programme. Under the leadership of Katja Matthes and Bernd Funke, the worldwide expertise on this topic was combined to create the best possible assessment of past, present and future solar variability. "The new data set will help to further improve our understanding of natural decadal climate variability and to distinguish natural more clearly from anthropogenic processes," Prof. Matthes concludes. New perspectives for long-term climate predictions?